How does someone live, knowing they are to die? In Iceland in 1829, Agnes has been sentenced to death; the date has not been fixed and while she waits, she is sent to live with the family of the district officer on their farm. The story of the murder which led to her sentence is drawn out in stages by the priest and the district officer’s wife, as well as sections narrated directly to us by Agnes. My interest was in the tension of living in the shadow of execution, and carrying on with everyday life, working at chores each day and finding some comfort in relationships. Because, as extreme and foreshortened as Agnes’s situation is, we are all under a death sentence. We just have the luxury of not dying at others’ hands while we are still healthy. 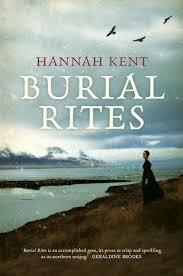 Kent conveys the drama of mortality well, with an assurance and insight beyond that of most first-time novelists. As a narrative, the dual strands work well: the clock ticking down to her execution as we move through Agnes’s narration of the past as well. It is probably the best way to narrate it. But I was conscious in this novel of how neat most retellings within narratives are. The story of the past unfolds chronologically in the present. I’ve been watching True Detective at the same time – same technique, with the protagonists telling their story ‘right from the beginning’. I’m doing the same thing in my new novel. Readers probably don’t mind, but I understand the desire of some writers to disrupt the chronology – say DeLillo in Underworld. There’s better examples, I’m sure; just can’t think of them right now. In life, you get bits of the stories in chunks, usually, mixed up and random. But that’s the whole process of narrativisation, I suppose. Giving shape to life.